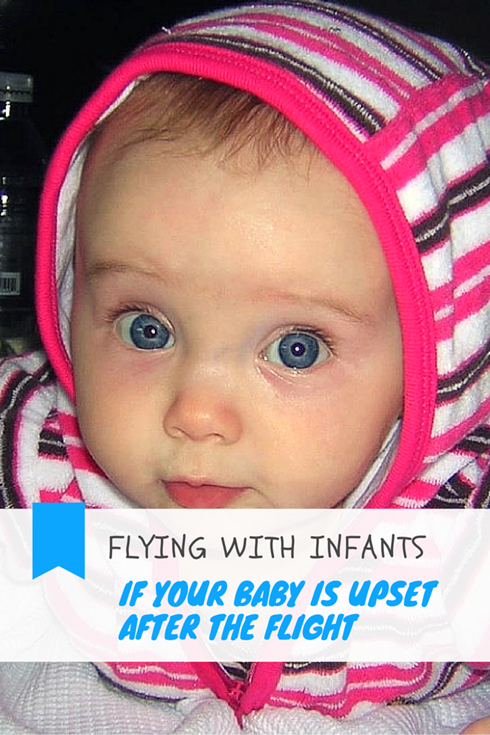 What if Your Infant is Upset After the Flight? Yesterday we returned from our first outing that required air travel, and we found that while we were completely prepared for our flight, we were completely unprepared for the aftermath. Our 5-month-old could not handle herself when we got home. We bathed her and fed her but she wouldn’t stop crying and could not fall asleep on her own. We think her ears were clogged or something hurt, but we don’t know what it could be. The exact same thing happened on our way there; uncontrollable cry and unable to go to sleep on her own. We have another trip in a couple of weeks and we would like to ask for your input or ask the site’s community for advice. Please let me know if you have any questions, your help is greatly appreciated. I asked the father a few questions and he told me that she did not cry on descent and was not pulling on her ears at home. She was laughing during taxi (fun girl ). The meltdowns came just minutes before arriving home on the first trip and on the return she was fussy in the car seat and had a meltdown when they were unpacking the car. So the meltdowns occurred when it was finally time to relax after the travel day. After finally falling asleep at night she woke up fine the next day, happy and back to normal. Has your child done fine during the travel day but been upset after the flight? What did you think was the cause in your case? I am an expert only in my own experience, not a medical professional, but in my opinion she was experiencing a sensory meltdown. This is not due to social anxiety for her, but due to over-stimulation from the travel day. It’s not something to be overly concerned about, and it is likely to change or be different for her every time you travel and at every different age and stage for her. -Joint Compression: massage arms and legs with gentle squeezing. -Body pressure: When your baby is in her stroller, car seat, or lying on her back, take your hand and press gently on her chest, while slowly jiggling her. The pressure is soothing. -Wrap tightly in blanket and hug. Rock if she tolerates it. -Crawling: If there is an opportunity in your travel day to let her crawl or climb (maybe a kid’s area in the airport?). If you do these activities throughout the travel day, it will help her maintain a balance and should help prevent the meltdowns. I am not implying that your daughter has sensory processing disorder, as my daughter does. Every child as they are developing has sensory challenges as their neurological system matures. As you meet the needs that these challenges present, your child can develop typically with less struggle. It doesn’t sound to me like her ears were an issue. 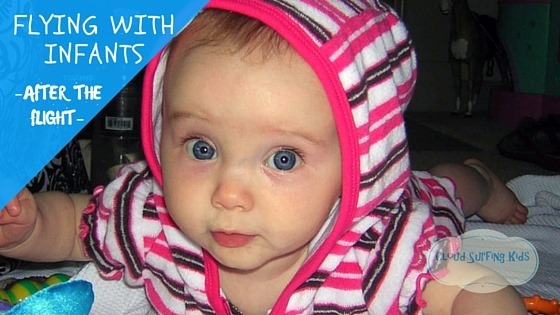 Another thing you can try is Hyland’s Infant Calming Tablets. They are homeopathic tablets used to: “temporarily relieve the symptoms of occasional sleeplessness, fussiness, agitation, irritability, and restless sleep; unpredictable, irregular sleep; waking at night; crying; inconsolable behavior”. (Quoted from the company’s website.) They are approved for ages 6mo. and up. I used these for my kids. They didn’t help my oldest much but did seem to help my now 3 year old. As they have no side effects or drug interactions, they are worth a try in my opinion. What do you think? Would you agree with my guess as to what was going on? Have you had a similar experience with your child? What other words of advice would you give to this father seeking answers? Do you have a question to ask? I’d like to start a series of “passenger questions” and would love to answer your questions there! Comment below or send me an email.